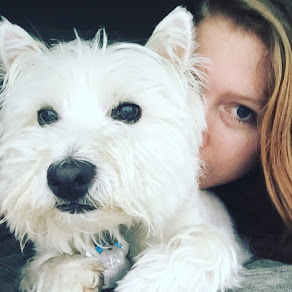 I've been sick for the past week - fever, aches, sore throat, cough and for four of the days I've had no voice. As such, I've been really into soft foods that won't aggravate my throat. Chocolate milk has been my best friend. And tea. Anywho, yesterday morning I got back from watching my father play soccer and wasn't sure what to make for breakfast. Then I saw a picture on Whole Foods' Instagram that was an egg baked in a sweet potato and thought, okay, let's go in that direction. 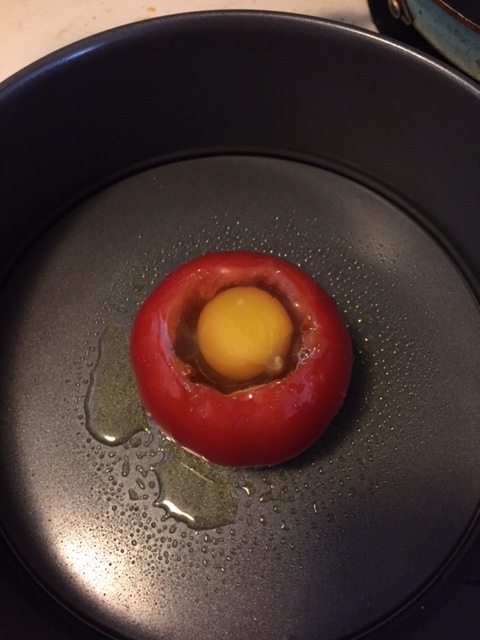 I've seen eggs baked in an avocado half, or peppers, so why not a tomato? 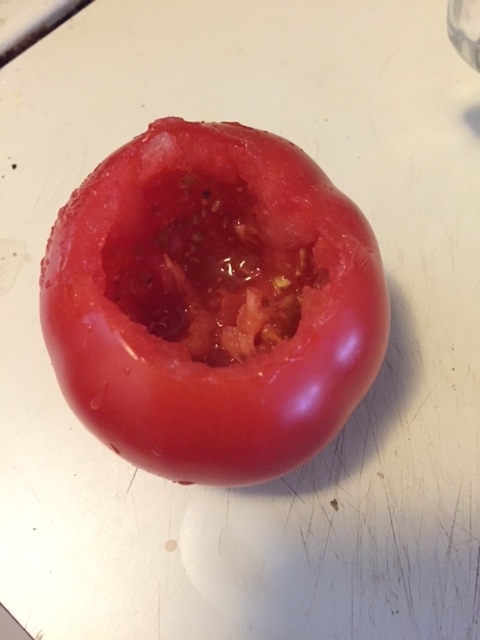 I took a tomato and cored it. Then I sprinkled in a little pepper and salt. I found an over-safe dish (clearly you can use anything as I used a cake pan), sprayed some PAM then placed the tomato on it. Pour an egg in and drizzled a little olive oil on top for good measure. I baked it at 350 until the white was no longer runny, about 15 minutes (I kept an eye on it). In the meantime, I made smashed potatoes to go with it. Super easy. I took a potato, removed about half the peel - basically the bad spots. Then I nuked it in the microwave for about 4 minutes, until a fork could easily pierce it. In a sizzling-hot skillet I poured about 2 tablespoons of Rosemary flavored olive oil (from Trader Joe's, but also of note, Truffle flavored olive oil is also a great addition if you'd prefer that). 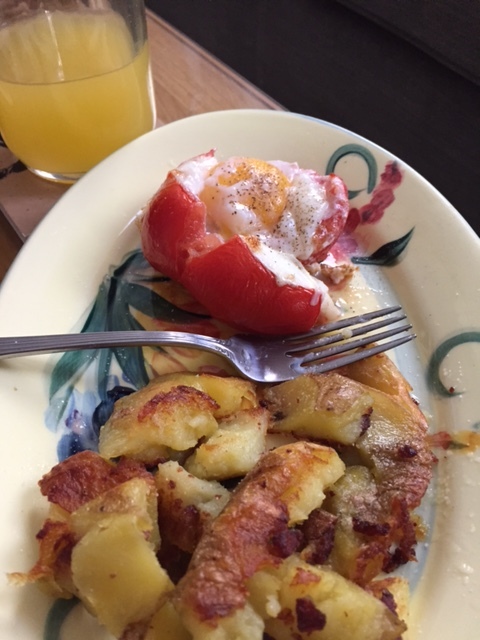 I cut the potato into pieces, nothing fancy, just breaking it down a bit (usually I use a potato masher to just smoosh the potato but I didn't feel like cleaning one more item, but that's what makes them "smashed" potatoes) and fried the potato while the egg baked. When the egg white was solid (but the yolk still runny) I removed it from the oven and sprinkled a little salt and pepper over top. And voila! 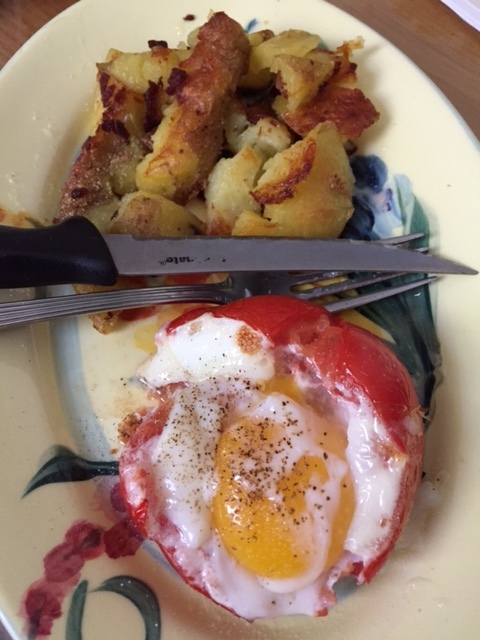 A different way to have your eggs! I screen shotted that exact picture from the Whole Foods account to remind myself to try it on a weekend morning! Love that you mixed it up with a tomato. Looks super duper delicious.